The Nanny Diaries meets The Wedding Planner in this smart, dishy novel from the author of Secret Lives of Husbands and Wives—featuring a woman who runs San Francisco’s premier baby planning company and the mommies-to-be who seek out her services. Katie Johnson may make her living consulting with new moms on the latest greatest baby gadgets no parent should be without, or which mommy meet-ups are the most socially desirable, or whether melon truly is the new black, but the success of her marriage to her husband, Alex, depends on controlling her own urges toward motherhood. He's adamant that they stay childless. Sure, Katie understands that he's upset over the fact that his out-of-town ex-wife rarely lets him see their ten-year-old son, Peter. But living vicariously through her anxious clients and her twin sisters' precocious children only makes Katie resent his stance more deeply. 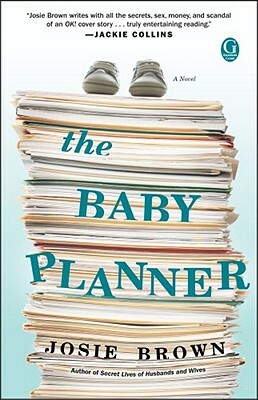 While helping a new client—Seth Harris, a high tech entrepreneur who must raise Sadie, his newborn daughter, as a single parent after the tragic death of his wife in childbirth—maneuver the bittersweet journey from mourning husband and reticent father to loving dad, Katie’s own ideals about love, marriage, and motherhood are put to the test as she learns ones very important lesson about family: How we nurture is the true nature of love. Josie Brown’s celebrity interviews and relationship articles have been featured in Redbook and Complete Woman magazines, as well as AOL, Yahoo, AskMen.com, Divorce360.com, and SingleMindedWomen.com. She lives in Marin County, California with her husband and two children. "I loved it! Josie Brown captures the highs and lows of love, lust and marriage with heart wrenching pathos. I'm recommending it to all my friends as the perfect beach read!" "I loved this juicy-as-it-it-is-heartfelt novel about love, marriage, friendship--and sharp, manicured claws. Could not put it down!" "Poignant and funny! Josie Brown’s protagonist is strong, resilient and unflinchingly honest; she has all the skills she needs to navigate the ‘mean streets’ of the gated community of Paradise Heights. A great read!"